The restored 1971 Van der Stadt 222 Mercury is once again gracefully slipping through the water, this time on the Knysna Lagoon. KNYSNA NEWS - In 1971, two Van der Stadt 222-design 42-foot sailing yachts were built; one (the Albatross II) in Knysna at the Thesen's Boatbuilding Yard, and the other (the Mercury) in Bremen, West Germany. Built of three layers of cold-moulded solid mahogany on a teak I-beam and stringers, and a teak cockpit construction, these sisters were built to aggressively compete in the first Cape to Rio trans-Atlantic ocean race. Mercury (sail number SA3) and Albatross II (sail number SA24) sailed neck and neck across the South Atlantic up to the last two days out of Rio until Mercury took a Southern course around a group of islands while Albatross held her course. Mercury lost her wind and ended 13th, while the famous Knysna built yacht, Albatross II won the race. Also participating was Voortrekker 1 (sail number SA1), the original South African flagship in the event, also built in Knysna by the Thesens. When Mark Orpen returned to Knysna five years ago, he had a vision to bring famous classic boats back to Knysna and restore them for visitors and tourists to admire and enjoy. He looked far and wide for Albatross II, tracking her through most of her former skippers that are still alive today, only to discover that she had eventually been scrapped and sold off bit by bit. He then found Mercury which was then brought to Knysna to restore her to her former glory. He immediately sought out local wooden boat builders from Thesen's in the 1970s and set out a restoration work programme based on diagrammes of Albatross II still held by the Thesens. However, only a few of the Thesen's Yard men were found, now rather advanced in years, so a number of younger local timber craftsmen were brought in to contribute to the restoration for a few months at a time over the past two years. More recently, was the dedicated and skilled architect and timber craftsman, Michael Woolf, who was employed to complete the outstanding restoration work, provide on-going vessel maintenance and be a bosun to the Garden Route Sailing Adventures fleet in Knysna. From the hull large sections of dry rot was removed in layers, the first layer, some of the second layer, and in some cases even layer three, and replaced using moulded strips of mahogany bonded with AMPREG 21 epoxy, donated complements of AMT Composites (SA). In 1986, Mercury had undergone major reconstruction when severe rot in her I-beam Keelson and some ribs had been replaced with aluminium. A number of local advisors suggested going for aluminium but Orpen decided on reverting to timber using Iroco supplied (and some donated) by Andy Stoker of Rare Woods Knysna. This required laminating the replacement ribs from Iroco, some up to eight layers thick, with the exercise consuming close to a cubic metre of Iroco, a timber with very similar properties to teak. "Over the two years of restoration, the programme went through many challenges, with costs rising to three times the original estimate, and twice the time estimate," explained Orpen. Parts and components available in the 1970s were no longer generally available and were sought out via ships chandlers in Ireland, England and Germany and when found were costly, but purchased to try to bring Mercury back to the original design. The boat was stripped naked and rebuilt on the water, in the water, in the open and in the Knysna Quays at her jetty. A naval architect, Captain Nigel Black, assisted by providing guidance and details of strengthening the I-beam joints and chain plate reinforcement pro bono over a period of one-and-a-half months. Then the matter of the engine. It was replaced with a new N438 diesel engine, one of the latest level energy efficient units with the lowest emissions on the market, with a new shaft and a new propeller as well. The other very important propulsion element was the mast, which was removed, re-coated and reinstalled. Her reinstalled rigging was inspected by Kevin Kussel of 30 years rigging experience who found most of her standing rigging to be in good order, repaired and tightened up. Viking donated the anti-fouling paint which was applied on the hard next to the Knysna Yacht Club in July/August. Lots of guidance was enjoyed from experienced yachtsmen of the Knysna Yacht Club, with John Young, Captain Brett Gething and Captain Ben Torrance of Garden Route Sailing Adventures, the local sail training school, to act as Mercury’s new skippers. The last element requiring attention were the sails. Sail designs have changed over the past 40 years. The original sails had more panels than present sails. Orpen wanted to hold to the original if possible and approached Quantum Sails of Cape Town, which sought overseas design assistance, and Mercury is now equipped with modern classic sails. It was the Genoa that presented the most difficulty, which was successfully resolved. Mercury now needed only to pass the South African Maritime Safety Authority Commercial Survey, which she passed on Friday, October 25. 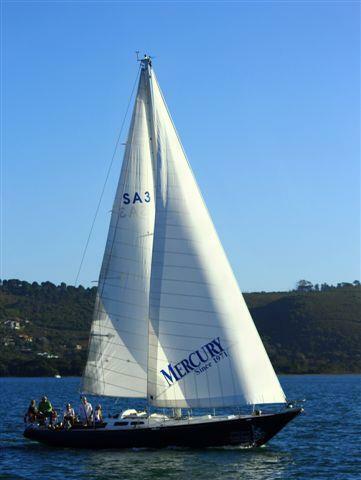 On Sunday, October 27, Mercury left her berth on her inaugural voyage, carrying a group of sailing enthusiasts, about to commence the one half of her purpose, to teach students the basics of sailing on one- and two-day introductions as well as SA Sailing competent crew programmes. The other half is to celebrate Knysna’s boating history which is extensive, and which hopes to enjoy South Africa’s very own tall-ship replica of the George Rex Brig Knysna, advanced by local Admiral Theo Honiball and historian Chris Henwood, if it comes into being.